Meet the highly skilled artisans who work in centuries-old workshops to bead, pleat, embroider and embellish the couture collections of Chanel, YSL and Dior. Technically speaking, the French term haute couture refers to the made-to-order creations of an elite group of designers, which currently include Chanel, Christian Dior, Givenchy, Jean Paul Gaultier, Versace and Valentino. Membership in this group is tightly regulated by the intimidating-sounding chambre syndicale de la haute couture — founded in 1868! — which mandates that all designated couturiers must maintain a full-time workshop, or atelier, of skilled artisans in the city of Paris. 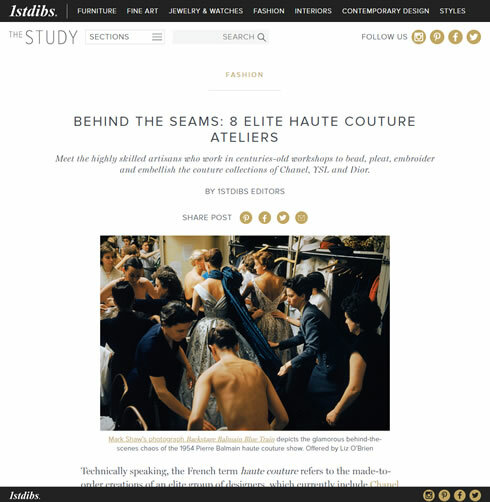 In these ateliers, seamstresses, designers and drapers meet with clients over multiple fittings to create one-of-a-kind pieces of extraordinary beauty and complexity.